Recently homeowners in Austin TX contacted us to build a unique and stunning pergola which encompasses all the spirit of Texas’ unique scenery by overlooking the river in Town Lake. The homeowners knew they wanted a two-sided pergola because when the house was originally purchased they had scaled models assembled depicting the projects they wished to do. The home has a fantastic view overlooking the river and gets plenty of wind and lots of sunshine. The existing deck is 22 feet off the ground and on a third story, this combined with the steep driveway of the home presented some difficult logistics in constructing the angled pergola which was designed to become part of the 3rd story decks integration. 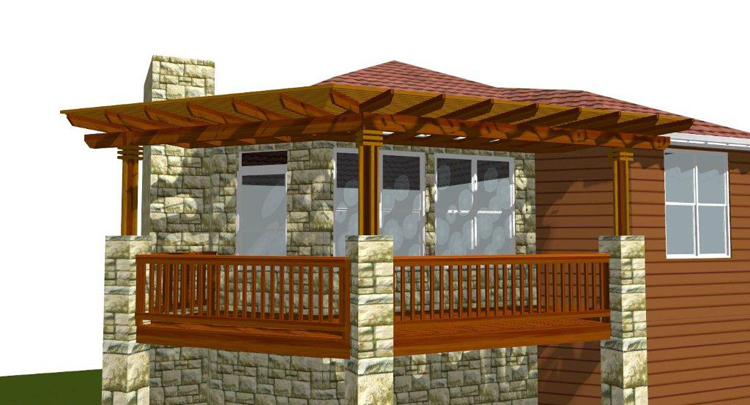 The addition of the pergola will help these homeowners utilize the deck properly and add shade to the upstairs deck as well as the windows of the home. The challenge for Archadeck of Austin was to get the materials for the pergola up to the 3rd story. We had to haul materials up to the third story using the homes internal winding staircase. The pergola itself is constructed of beautiful western red cedar which compliments the traditional Mexican clay tile roof. we extended the joists a little further so the pergola would have a cantilever effect. 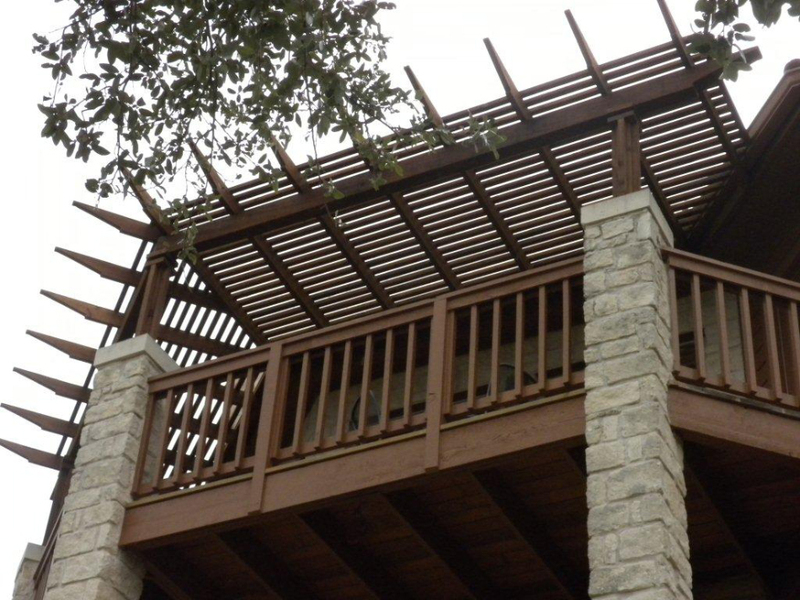 The lathing on the pergola spans about 1.5″ apart as to provide shade within the pergola. The design of this pergola is unique and innovative. Pergolas have become very popular recently. A simple flip through of any home magazine while in the grocery store checkout line will prove this. Pergolas, although they seem simple, can be very complex to build. If not constructed correctly and with sustainable materials, will wither and decay very quickly. 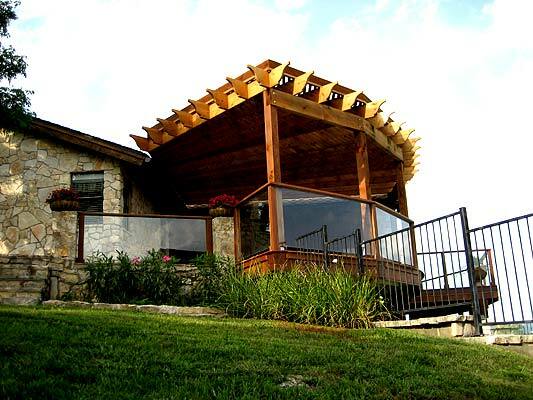 Archadeck of Austin uses top quality materials to construct their pergolas and their designs can be tailor-made to suit your needs. We can space the lathing as such that you can use your pergola to add shade to a sunny spot. we can also add decorative elements to your pergola that you just can’t get unless you have a custom builder to construct it. This entry was posted on July 4, 2011 by nicoleplyler. 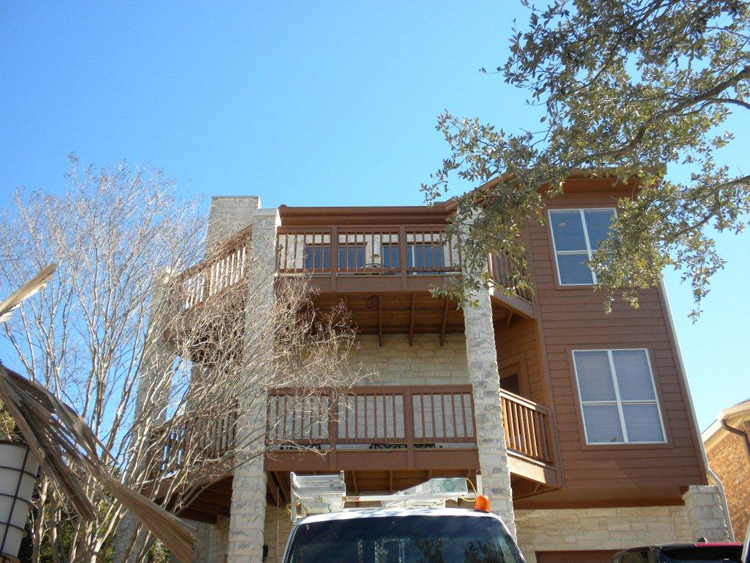 It was filed under 3-story decks, Austin decks, Decks, Pergolas, Protection from the elements and was tagged with Archadeck of Austin, Austin cedar Pergola, Austin deck builder, Austin decks, Austin pergola, Pergola builder Town Lake TX, Pergola Town Lake TX, Town Lake cedar pergola.